Institut du Cerveau et de la Moelle épinière, Paris ; INSERM, UPMC Paris-6, CNRS, France. Inhibitory neurons express the Green Fluorescent Protein in a 5 day old zebrafish larva. Colors represent depth. Image from Dr. Kristen Severi, transgenic line from Prof. Shin-ichi Higashijima. Claire Wyart and her research group investigate the role of sensory integration in the vertebrate spinal cord. The focus of the team is to study how external sensory inputs reflecting the environment as well as inner sensory inputs reflecting our physiological states modulate the activity of motor circuits. The team is interested to find out how inner physiological states can impact and control our locomotion and posture via a sensory motor loop present in the spinal cord and without our brain being necessarily involved. 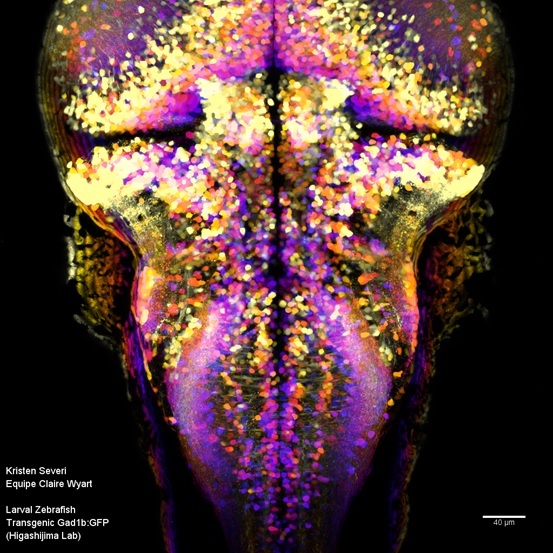 The team took advantage of the transparency of the zebrafish larva to conduct in vivo studies linking genes, to motor circuits and innate behaviors. Claire Wyart received a training in Neurosciences and Biophysics. She graduated from the Ecole Normale Supérieure Ulm in 2000 and performed her PhD with Dr Didier Chatenay and Laurent Bourdieu in the Institute of Physics of the University of Strasbourg. From 2000 until 2003, she developed in vitro systems for controlling neuronal connectivity in vitro and studied the nature of spontaneous activity emerging from these simple networks (Wyart et al., 2000, 2004). After one year of humanitarian work in asia, Dr Wyart joined University of California in Berkeley as a Marie Curie postdoctoral fellow. She spent one year in Prof. Noam Sobel’s lab to study the effects of male putative human pheromones on female physiology in humans (Wyart et al., 2006). Then, she moved to the lab of Prof. Ehud Isacoff who was developing in vitro the chemo-optogenetics approach by which the function of receptors is manipulated using chemical photoswitches. She demonstrated that the chemo-optogenetics approach was operational in vivo by taking advantage of a small transparent animal, the zebrafish larva (Szobota et al., 2007). This approach enable to manipulate the activity of neurons remotely with light in intact transgenic animals. She used this method to reveal a link between neurons contacting the cerebrospinal fluid (CSF), which are conserved throughout vertebrates and whose functions were completely unknown, and the initiation of locomotion (Wyart et al., 2009). 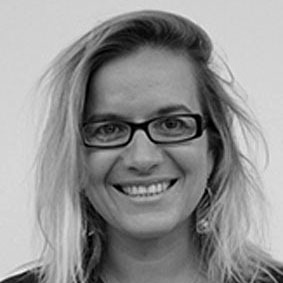 Claire Wyart started her lab in 2011 in the brain and spine institute in Paris, ICM. Her team focused on investigating the integration of local sensory inputs during locomotion. The team developed a new algorithm for tracking and categorizing at high throughput zebrafish larva behavior (Mirat et al., 2013). The Wyart team demonstrated that the morphology and markers of neurons contacting the CSF were conserved throughout vertebrates by analysing the spinal cord of mouse and macaque in particular (Djenoune et al., 2014). The sensory inputs to these neurons were not known. Claire Wyart and collaborators demonstrated that these spinal neurons detect bending of the spinal cord (Böhm, Prendergast et al., 2016). The team identified the circuits on which these neurons are projecting (Fidelin et al., 2015 ; Sternberg, Severi et al., 2016 ; Hubbard et al., in press). Andrew Prendergast and Laura Desban from the Wyart team performed a transcriptome analysis on neurons contacting the cerebrospinal fluid. This analysis confirmed by in sity hybridization and immunohistochemistry revealed interesting targets for modulating the excitability of the motor circuits in the spinal cord. The laboratory is now investigating the physiological relevance of these pathways. Furthermore, the Wyart team continues to map and probe the motor circuits underlying locomotion. Knafo et al. identified the contribution and connectivity of glutamatergic mechanosensory feebdack during active locomotion (Knafo, Fidelin et al., in preparation) as well as the functional organization of hindbrain circuitry driving the spinal cord during active locomotion (Severi, Böhm et al., in preparation). The zebrafish larva offers an amazing opportunity to probe the motor circuits from genes to behavior using emerging technologies based on genetics and optics. The results identified by the Wyart team has been confirmed in other species (Jalalvand et al., 2016a,b) and should open new avenues of research in mammals (see Petracca et al., Development 2016). Mechanosensory neurons control the timing of spinal microcircuit selection during locomotion. Optimization of a Neurotoxin to Investigate the Contribution of Excitatory Interneurons to Speed Modulation In Vivo. CSF-contacting neurons regulate locomotion by relaying mechanical stimuli to spinal circuits. State-Dependent Modulation of Locomotion by GABAergic Spinal Sensory Neurons. Optogenetic dissection of a behavioural module in the vertebrate spinal cord.